AJF’s first service projects were working as teacher aids in day care centers, serving as examiners with Volunteers for Vision, and providing monthly bingo parties for nursing home residents. Ties were also established with Shoalcreek Rehabilitation Hospital providing volunteers one day each week. For fundraising projects, members sold homemade decorated pumpkins and scarecrows at Halloween, held luncheon card parties, and sponsored a style show with fashions from Neiman Marcus. In the spring of 1971, AJF made two significant decisions simultaneously. They decided to produce their first ‘Follies’ and to adopt the Texas Youth Ranch (a home for dependent and neglected boys). Over the next seven years, they gave more than $125,000 and innumerable hours of volunteer service to the Texas Youth Ranch. Members befriended the boys, provided off-campus experiences, and entertained them in their homes. Due to the courts, welfare agencies, and state agency partial funding policies, the complexion of the TYR changed over time. It was decided in the summer of 1978 to close the Texas Youth Ranch. The first ‘Follies’ was produced in 1972. The ‘Follies’ was a ‘ways and means’ project to help support the TYR. After five consecutive ‘Follies’ it was decided a production every other year was more practical. In 1977, ‘Forum Fling’ was conceived as an additional ‘ways and means’ project to help support AJF’s growing services in the community. ‘Forum Fling’ was a western dance featuring a popular western personality, door prizes, buffet and beverages. After being approached by the Austin Recreation Department, Austin Junior Forum members accepted a new commitment – to raise funds for the purchase of Teddy Bear stuffed animals for the Austin Police Dept., EMS, Sheriffs Dept. and Dalmatian stuffed animals for the Austin Fire Dept. 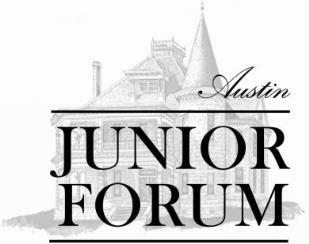 In September 1986, the Austin Junior Forum hosted its first Teddy Bear Picnic at The Caswell House. The Teddy Bear Program has taken on many different facets over the years, but remains a steadfast project that AJF members gladly dedicate themselves to each year. The policy of giving a stuffed animal to a child in a crisis situation has grown to giving stuffed animals to senior citizens with Alzheimers or to children high on drugs. The stuffed animals have a calming effect and provide something tangible to hold during the time of crisis. The service projects that AJF members have participated in over the years are many and varied. One of the longest service project commitments that AJF members have embraced is Kids on the Block. This project was established in the mid 1980’s when mainstreaming was introduced into the public schools. The focus of the project was to educate school age children on disabilities and individual differences through the use of puppets. The program eventually expanded into education with regard to drug and alcohol abuse and then gang violence. There is a continuing need in the community for the education and awareness that this project provides and it remains in great demand today.